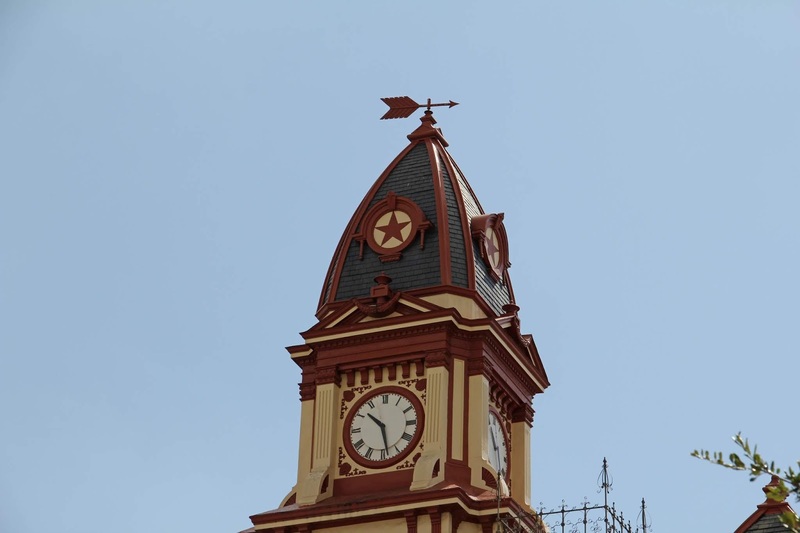 The Caldwell County Courthouse clock tower stands high above the surrounding buildings signalling to approaching visitors that they are near the Historic District. 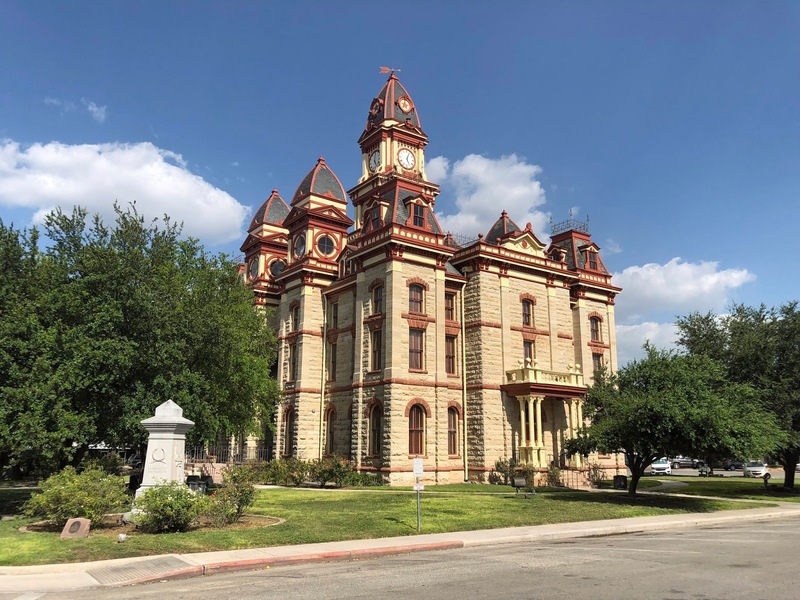 The ornate tower is the first hint of the eyecatching details of this 1894 Courthouse designed by Henry E.M. Guidon who eventually became a partner of San Antonio architect Alfred Giles. Contractor was Martin, Brynes and Johnston with an approximate cost of just over $54,000. 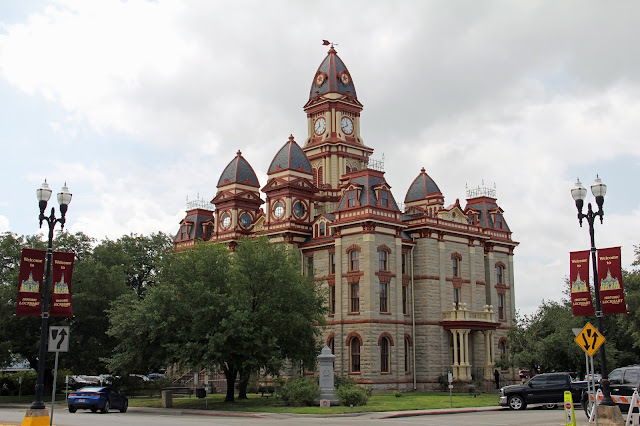 The plans would be used again for the construction of the Goliad County Courthouse. 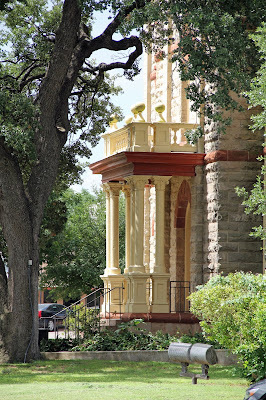 The clock tower houses the original 4-sided Seth Thomas clock and 900 pound bell. The clock has been restored after being removed from the tower in 1994 due to poor maintenance and theft of parts. It rested on the dirt floor basement of the County Clerk's building until it was removed in 2008 and restored. It's chime is beautiful! Designed in the poplar Second Empire style with the Mansard roof and imposing clock tower, the Courthouse has towers that flank the north and south entrances and porticos on the east and west entrances. 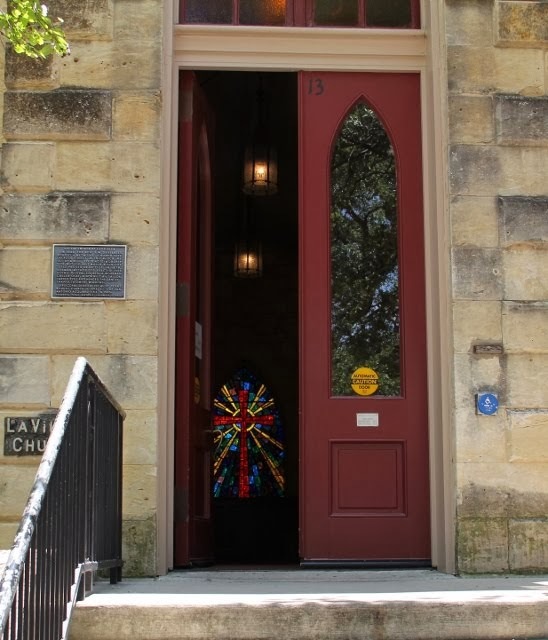 The porticos were added after the contract was awarded at an additional cost of $600. The walls are sandstone blocks and the trim is "red muldoon stone" as specified in the construction contract. The building was built with electricity; water lines would be added later. A remodeling sometime prior to 1978 reconfigured much of the interior and covered original features with drop ceilings and plastic panelling; however, a $1.6 million renovation project between 1991 and 2000 restored the Courthouse interior to much of its original appearance and added HVAC, data/telecommunication capabilities and updated fire alarm and sprinkler systems. Second floor courtroom - I believe these benches were from the original courtroom, note the tile floor that is throughout the Courthouse. Balcony is accessible from the third floor. The Courthouse was recorded as a Texas Historic Landmark in 1976. The Caldwell County Courthouse Historic District, which includes the Courthouse and 84 surrounding buildings on 25 acres of land, was added to the National Register of Historic Places in 1978. 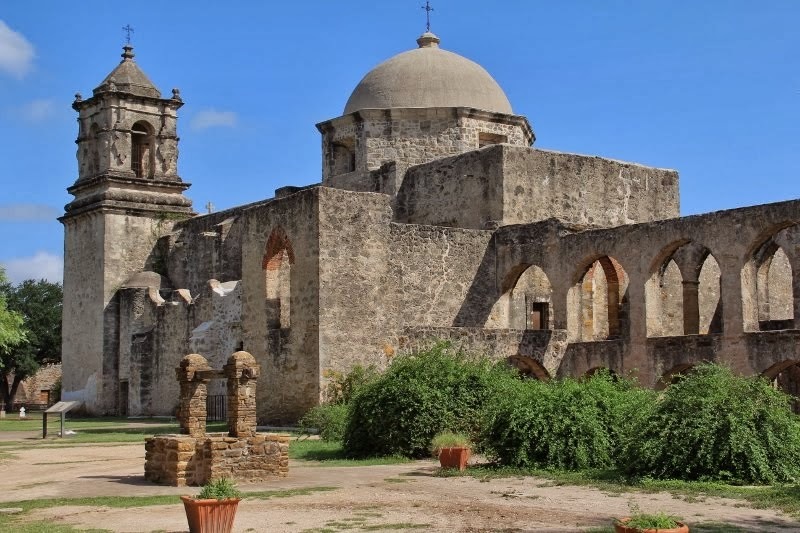 The perfect event starts with an extraordinary location. Whether you are dreaming of a grand entrance on a mountaintop vineyard estate, or an intimate gathering of family and friends at a seaside villa, good managers, like those at these New York venues are able to turn that dream into an extraordinary event.